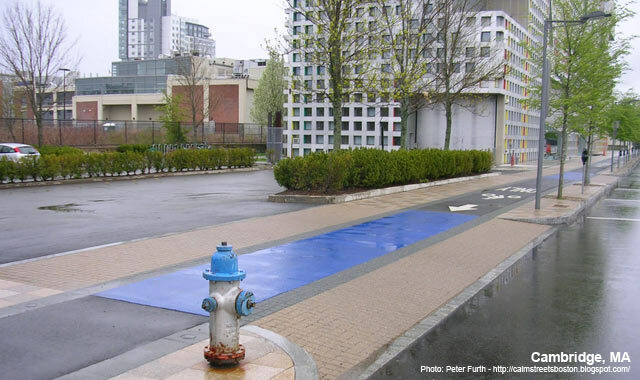 In 2003, Vassar Street in Cambridge, MA underwent a full reconstruction as part of a large scale building project undertaken by the Massachusetts Institute of Technology (MIT). As part of the development, the city redesigned a one mile stretch of Vassar Street from Main St. to Audrey St. with east and westbound raised cycle tracks at sidewalk grade level. 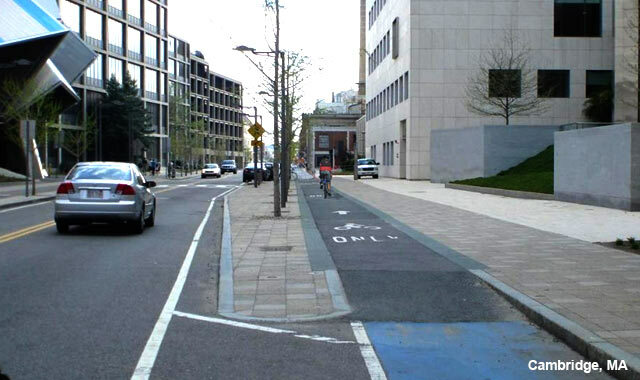 The cycle tracks, which are each 5’ wide with 5’ landscaped buffers separating the bikeway from parked cars, serve as a primary east-west route across the MIT campus for cyclists and as a connector to the Kendall Square area and the riverfront. The configuration of the bikeway took into account a number of site constraints and employed many innovative treatments. The bikeway sits at grade with the sidewalk due to the prohibitive costs of reconfiguring existing underground utilities. The cycle track is primarily differentiated from the sidewalk by its material- a hot mix asphalt edged with grey concrete pavers. In addition to these features, the track has prominent “bicycle-only” pavement markers, blue paint at points of conflict, bulb-outs at crosswalks to shorten crossing distances, and other traffic calming devices such as shoulder-less vehicle lanes, raised crosswalks, and prominent signage warning motorists to watch for cyclists. 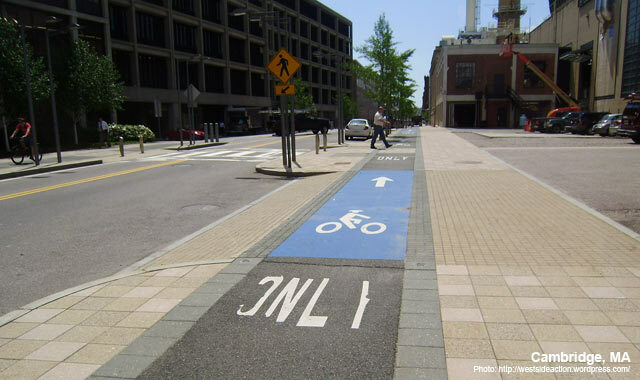 The city of Cambridge constructed the Vassar Street cycle track in two phases. The eastern portion was completed in 2004 and the western portion in 2008. 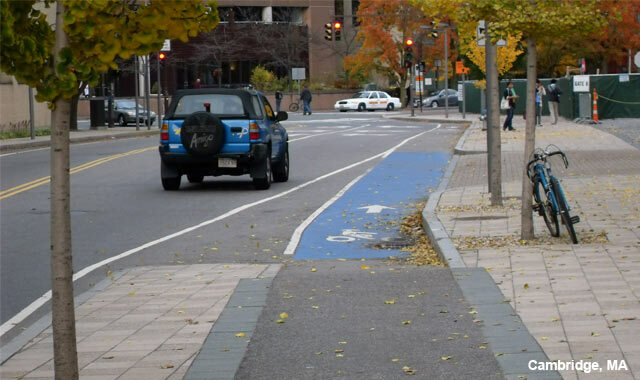 The design of future cycle tracks in Cambridge has been revised to more adequately separate bicyclists from pedestrians by placing street furniture in between the two modes.